Be sure that students understand the answer to this question beyond saying the word, ëlectromagnetism." What, exactly, does this word mean? Reciting an equation is not a sufficient explanation, either. Ask them what some of the factors are that influence the strength of the electromagnetic effect. When a coil of wire "cuts through" magnetic lines of flux, what phenomenon occurs? Be sure that students understand the answer to this question beyond saying the phrase, ëlectromagnetic induction." What, exactly, does this phrase mean? Reciting an equation is not a sufficient explanation, either. Ask them what some of the factors are that influence the strength of the inductive effect. If one coil of wire is located very close to another coil of wire, and an electric current is passed through the first coil whose magnitude changes over time, what phenomenon will occur in the second coil of wire? A voltage will be induced in the second coil: mutual induction. Be sure that students understand the answer to this question beyond saying the phrase, "mutual induction." What, exactly, does this phrase mean? Reciting an equation is not a sufficient explanation, either. Ask them what some of the factors are that influence the strength of the mutual inductive effect. Follow-up question: algebraically manipulate this equation to solve for the number of turns (N) given all the other quantities. It should be noted that in this particular case, N is equal to three (counting the turns in the illustrated coil). Write two equations describing the induced voltage at each winding (ep = ... and es = ...), in each case expressing the induced voltage in terms of the instantaneous magnetic flux (f) and the number of turns of wire in that winding (Np and Ns, respectively). Then, combine these two equations, based on the fact that the magnetic flux is equal for each winding. Obtaining the last equation is an application of the mathematical truth that quantities equal to the same thing are equal to each other (if a = c and b = c, then a = b). Write two equations describing the induced voltage at each winding (ep = ... and es = ...), in each case expressing the induced voltage in terms of the instantaneous current through that winding (ip and is, respectively) and the inductance of each winding (Lp and Ls, respectively). The first two equations are mere review. The second two equations require algebraic manipulation and substitution between equations. If the inductance of the primary coil is 2 H, what is the inductance of the secondary coil, assuming that it ßees" the exact same magnetic circuit as the first coil (same permeability, same cross-sectional area, same length)? If an electric current changing at a rate of 30 amps per second passes through the primary coil, how much voltage will be induced in each coil? If only half the lines of magnetic flux from the primary coil "coupled" with the secondary coil, how much voltage would be induced in the secondary coil, given a primary current rate-of-change of 30 amps per second? If only half the lines of flux coupled the two coils (k = 0.5), then es = 90 volts. Follow-up question: what do you notice about the ratio of primary and secondary inductances compared with primary and secondary winding turns? Can you generalize this in the form of an equation? The key to this question is determining the ratio of inductances, based on the ratio of turns in the windings. As the answer reveals, it is a nonlinear proportionality. The sentence where I specify the ßame permeability, same cross-sectional area, same length" is a hint to students for what equation they need to find in order to identify the relationship between wire turns and inductance. When the magnetic coupling between the two inductors is perfect (k = 1), how does M relate to L1 and L2? In other words, write an equation defining M in terms of L1 and L2, given perfect coupling. Challenge question: is mutual inductance expressed in the same unit of measurement that self-inductance is? Why or why not? The solution to this question involves quite a bit of algebraic manipulation and substitution. Of course, it may also be found in many basic electronics textbooks, but the point of this question is for students to see how it may be derived from the equations they already know. 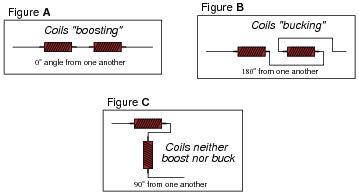 The coefficient of magnetic coupling between two coils affects the amount of mutual inductance between those two coils. This fact should be obvious, as coils not sharing any magnetic flux (k = 0) cannot have any mutual inductance between them. Write an equation defining M in terms of L1 and L2, when k is something less than 1. Ask your students how they obtained their answer. Of course this equation may be found in many basic electronics textbooks, but the point of this question is for students to see how it may be derived from the equations they already know. Explain why this wiring technique eliminates inductive heating of the conduit. Now, suppose two empty metal conduits stretch between the location of a large electric motor, and the motor control center (MCC) where the circuit breaker and on/off "contactor" equipment is located. Each conduit is too small to hold both motor conductors, but we know we're not supposed to run each conductor in its own conduit, lest the conduits heat up from induction. What do we do, then? This wiring technique is very commonly used in industry, where conductor gauges for high-horsepower electric motors can be quite large, and conduits never quite large enough. However, upon testing this parallel inductor arrangement, the technician finds the total inductance to be significantly less than the 167 mH predicted. Puzzled, he asks a fellow technician for help. The other technician inspects the board, and immediately suggests that the two inductors be re-located with their axes perpendicular to one another. The first technician doesn't understand why the physical location of the inductors should matter. After all, it never mattered how he located resistors and capacitors with respect to one another, so long as their connecting wires (or board traces) went to the right places. Can you explain to him why inductors might be sensitive to physical orientation? Presently, the respective magnetic fields from the two inductors are linking with each other in an opposing manner! What trigonometric function (sine, cosine, tangent, cotangent, secant, cosecant) follows this same pattern: full positive at 0o, full negative at 180o, and zero at 90o? A potential point of confusion here is that some students may think the orientation being spoken of is absolute: with reference to the earth's magnetic field. What I'm trying to get them to see, however, is the relationship between the two coils' magnetic fields, which is an entirely different matter. To expose this misunderstanding, ask your students whether or not the position of the printed circuit board with respect to compass directions (north, south, east, or west) would have any effect on these two inductors' combined inductance. For those who mistakenly answer ÿes" to this question, review Faraday's Law of electromagnetic induction: that induced voltage only occurs when there is a change of magnetic flux over time, and that the earth's magnetic field is constant (for all practical purposes). The follow-up question gets students thinking in terms of the mutual inductance as a function of the physical angle between the two inductors, and relating a pattern (analyzed at three points) to common trig functions. This form of reasoning is very useful in problem-solving, because the ability to see patterns as a function of a certain variable (such as an angle) is the first step in mathematically modeling a system. 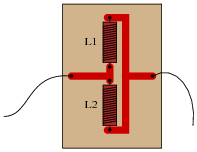 Explain what leakage inductance is, in a system of two or more mutually coupled inductors (such as a transformer). In a transformer, is leakage inductance a good thing or a bad thing? "Leakage inductance" is inductance that is not mutual between coupled inductors. It is caused by magnetic flux produced by one coil that does not "link" with turns of the other coil(s). In power distribution transformers, leakage inductance is undesirable. However, there are some applications where leakage inductance is a desirable attribute. Step-up transformers used to power gas-discharge lights, for example, are purposely built to have significant amounts of leakage inductance. After discussing the nature of leakage inductance (what causes it, and how it manifests itself in a transformer circuit), ask your students to explain why we do not want to have leakage inductance in a power distribution transformer, and why we do want to have it in a gas-discharge lighting transformer.